Helena Qi never expected to become a chemist. In fact, she often quips – tongue in cheek – that she’s bad at chemistry. Qi, a Department of Energy Computational Science Graduate Fellowship (DOE CSGF) recipient, caught the research bug early through the Waksman Program, a partnership between Rutgers University and nearby New Jersey high schools. In after-school classes and during one summer, she and a team of student researchers examined rootless duckweed (Wolffia arrhiza), carrying out genetic studies to better understand the life and ecology of the world’s smallest vascular plant. But when Qi (pronounced Chi) arrived at Wellesley College, no microbiology labs had an opening for a new researcher. So she broadened her search. “I can code. Maybe I should look at some of the other groups that do computational sciences,” Qi says. (Her mother is a statistical programmer.) Qi landed in the computational chemistry lab of Mala Radhakrishnan, a DOE CSGF alumna, where the team was studying how crowding and charges within protein structures affect how those molecules recognize each other. 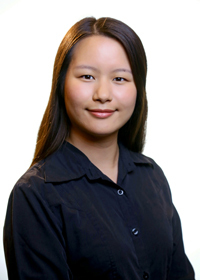 During the summer after her sophomore year, Qi worked in Donald Truhlar’s lab at the University of Minnesota, researching fragment methods, computational tools for understanding interactions in water clusters and other systems. In 2014 Qi headed to the Massachusetts Institute of Technology for a chemistry Ph.D. Working with Heather Kulik, she’s continued to investigate proteins, exploiting the computational power of graphics processing units (GPUs) to examine very close interactions between atoms in their structures. To investigate, Qi sifted through the Protein Data Bank, isolating more than 13,000 high-quality structures with sufficient resolution to pinpoint the location of all atoms. “From that I’ve extracted all the cases where atoms are closer than you would expect and applied quantum mechanical methods to understand them,” she says. It’s the first time researchers have been able to do this type of study while including electron interactions, improving accuracy over less intensive methods that rely more on approximations. Before the advent of GPUs, computer clusters weren’t powerful enough to use quantum mechanics to simultaneously study interactions among so many atoms, she notes. With those results, Qi has combed the data seeking patterns, in particular whether certain protein building-blocks, amino acids, frequently occur in these close-contact situations. She suspected that, because of its structure, the amino acid tyrosine could join in favorable close interactions with other parts of the protein. In fact, tyrosines show up in these interactions more often than expected given their prevalence. Qi is still working on additional ways to verify whether these tyrosines make proteins more stable overall or are simply trapped within their local environment. “It’s a common problem in chemistry: you never know if you’re in the local optimum or the global optimum,” she says. Her work could help researchers better understand how proteins are bound and how they interact with other molecules in a living cell. Qi’s practicum work at the SLAC National Acceleratory Laboratory in 2017 gave her more experience with GPU programming. Working with DOE CSGF alumnus Rob Parrish in Todd Martinez’s laboratory, she worked on refining a quantum mechanical method, MP2, to run completely on a GPU, minimizing external communication. While the Martinez group had succeeded in running the method on GPUs, it still had to pull information from other processors, slowing the calculations. She uses the insights she gained into GPU programming to troubleshoot her Ph.D. research. Image caption: Many protein structures (green ribbons) have closer contacts between atoms (red circle, left) than expected. Using GPU clusters and the TeraChem software package, Helena Qi has used quantum mechanical methods to run calculations of thousands of atoms (red region, right, and enlarged red circle). Those calculations allow them to accurately measure the electronic interactions at the center of that region and determine whether a close contact is a favorable interaction. Credit: Helena Qi.